Breakfast Bean Bowl: Warm homemade beans with some of their cooking liquid (or canned beans, rinsed). 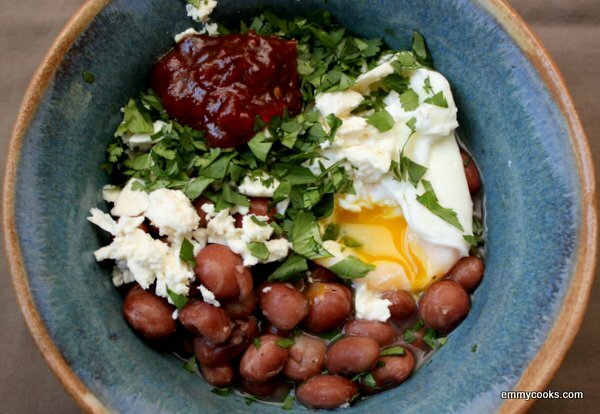 Top with a poached egg, grated or crumbled cheese, parsley or cilantro, and tomato jam or salsa. You may find that you want a piece of toast for sopping up the last bites. Emmy I love that you are showing food for breakfast that is sustaining and energizing and not the usual flour and sugar junk. I consider almost any food fair game for breakfast! This is perfect! Love the combination. I think tomorrow morning I’m going to give this a try. Very nice pic. Looks delicious. I love the oozing, golden yellow egg yolk. Perfection! You paint a wonderful picture of Fall. Very beautifully stated :D I love the wonderful aroma of cooking a pot of beans. Always reminds me of childhood, when my mother would cook up batches over the weekend. Beans are so versatile and be tasty in so many dishes.